Kunming Old Street consists of 10 old streets, such as Qianwang Street, Tongren Street, Nanqiang Street, Guanghua Street, Jinbi Road, Xiangyun Street, Wenming Street, Jingxing Street, Wenmiaozhi Street and Yongdao Street. Most of the streets are 90 years old. The buildings on the streets are in the Qing Dynasty (1644 - 1912) style or in the style of the Republic of China (1912 - 1949). With a length of 435 meters, Guanghua Street starts from Zhengyi Road in the east to Wuyi Road in the west. Kunming's ancient style remains at the street. On Guanghua Street, you could taste the authentic thin rice noodles cooked in a small pot, and you can find the various antiques with Yunnan features. Century-old pharmacies are the highlights of the street as well. Set up in 1926, Nanqiang Street offers old buildings in the style of the end Qing Dynasty and the early Republic of China. 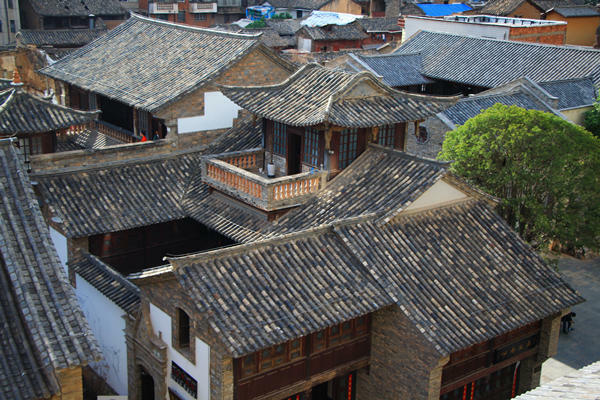 For example, Renhexiang House originally built in 1904 is a two-story brick-and-wood structure in the style of the courtyard which is popular in Dianzhong Region (Kunming, Qujing, Chuxiong and Yuxi) at that time. On Qianwang Street, you will find an old house with a watchtower, which is rare in Kunming. You could refresh yourself at Starbucks in an old house or enjoy the professional electroacoustic music at a bar. In addition, the street is lined with a variety of handicrafts shops, such as hand-made bamboo ware, hand-made shoe-pads and the like. On Zhengyi Road, the oldest stone street lamp in the Qing Dynasty has a base. Nowadays, it is well-preserved in a courtyard of a police station. Zhengyi Road also offers various types of cuisine, such as Japanese Cuisine, Sichuan Cuisine, Korean Cuisine, etc. Jingxing Street combines flowers and birds. You will see colorful flowers and varied articles there. If interested, you could visit the Yunnan Tea Culture Museum on Wuyi Road. If you are planning to visit the street for photography purposes, the best time to visit is in the evening. If you would like to explore the local life, the best time to visit is during the daytime. As Kunming Old Street is composed of 10 streets, you could get to any one of the streets by bus. Therefore, there are several options. Rent a vehicle to any one of the streets. This is the quickest and most direct option. Take Bus 1, 2, 54, 61, 69 and Bus 237 to the Stop of Wenmiao (文庙). As at 10th January 2019, the entrance pricing to the old street is free of charge. Interested in visiting Kunming Old Street on a Tour? Wendy Wei Tours offers a variety of different packaged tours as well as custom tours including Kunming Old Street, among other attractions and destinations. To find out more, please visit our Tours page or Contact Us directly to find out more.